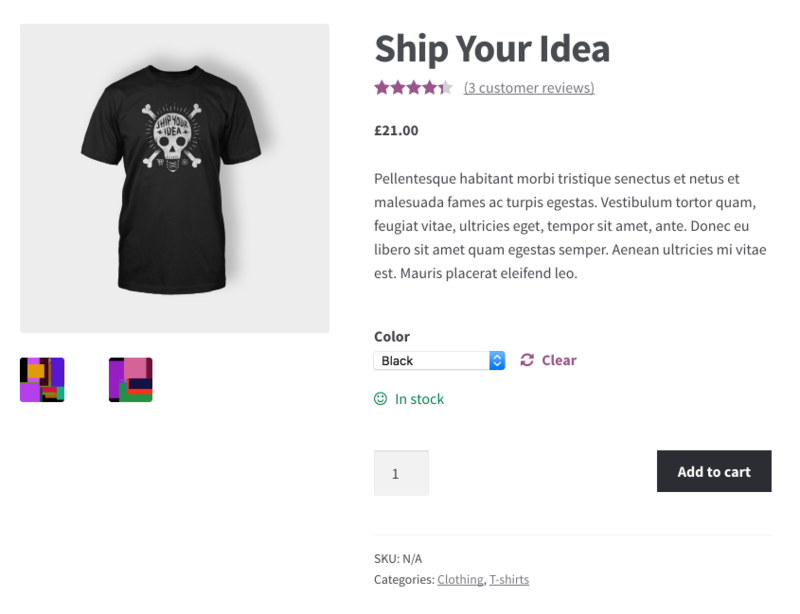 Variable products are a product type in WooCommerce that lets you offer a set of variations on a product, with control over prices, stock, image and more for each variation. They can be used for a product like a shirt, where you can offer a large, medium and small and in different colors. 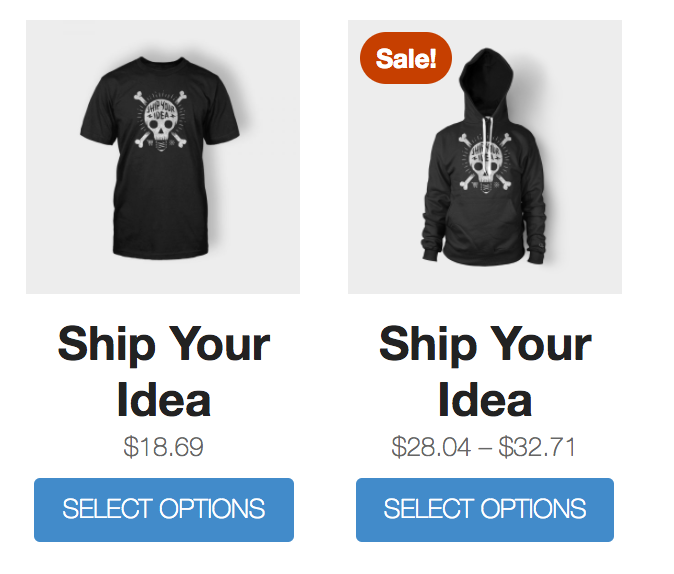 Go to: WooCommerce > Products. 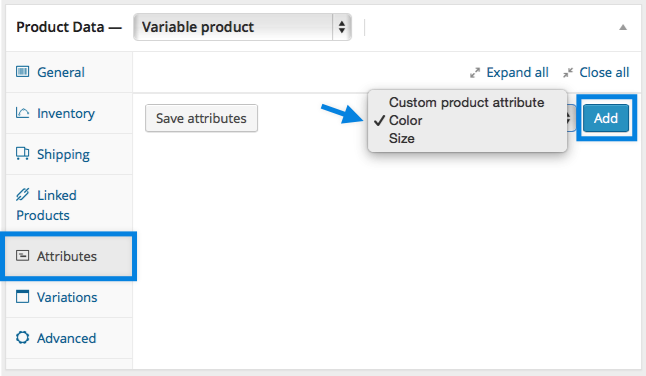 In the Attributes section, add attributes before creating variations — use global attributes that are site wide or define custom ones specific to a product. Select one from the dropdown and Add. 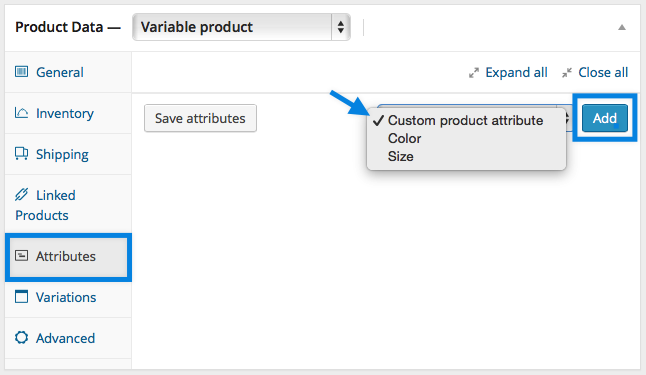 Choose Select all to add all attributes to the variable product (if applicable). Tick the Used for variations checkbox to tell WooCommerce it’s for your variations. 1/ Select Custom product attribute, and Add. 4/ Enable the Used for variations checkbox. 2/ Select attributes for your variation. To change additional data, click the triangle icon to expand the variation. 3/ Edit any available data. The only required field is Regular Price. Each variation may be assigned. Downloadable – If this a downloadable variation. Virtual – If this product isn’t physical or shipped, shipping settings are removed. Tax status — Taxable, shipping only, none. Tax class – Tax class for this variation. Useful if you are offering variations spanning different tax bands. Downloadable Files – Shows if Downloadable is selected. Add file(s) for customers to download. Download Limit – Shows if Downloadable is selected. Set how many times a customer can download the file(s). Leave blank for unlimited. Download Expiry – Shows if Downloadable is selected. Set the number of days before a download expires after purchase. SKU – If you use SKUs, set the SKU or leave blank to use the product’s SKU. Manage Stock? 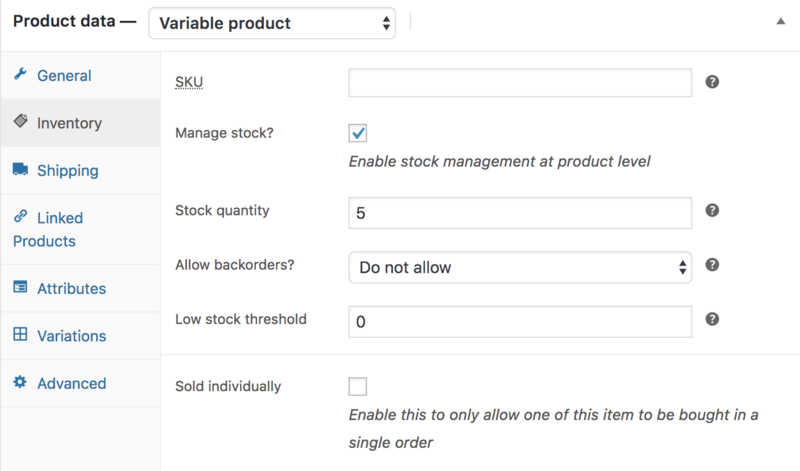 – Tick the box to manage stock at the variation level. Stock Quantity – Shows if Manage Stock is selected. Input the quantity. Stock for the specific variation, or left blank to use the product’s stock settings. Allow Backorders – Choose how to handle backorders. Low stock threshold – Enter a number to be notified. Set Stock Status can be applied to all variations at once to In stock or Out of stock. Bulk-update under Variations. Weight – Weight for the variation, or left blank to use the product’s weight. Dimensions – Height, width and length for the variation, or left blank to use the product’s dimensions. Shipping class – Shipping class can affect shipping. Set this if it differs from the product. If the SKU, weight, dimensions and stock fields are not set, then it inherits values assigned to the variable product. Price fields must be set per variation. To save time, you can make a copy of a product and its variations to create similar ones. More at: Duplicating a Product. You can bulk-edit variations by selecting the specific piece of data you want from the dropdown. In this example, I want to edit prices for all variations. 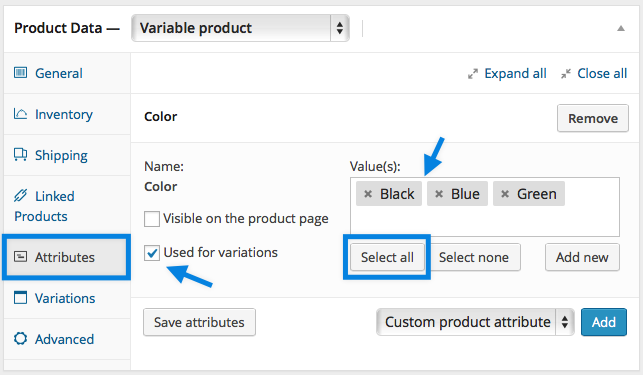 You can select Create variations from all attributes to have WooCommerce create every possible combination of variations. If you later add additional attributes, it may require the variables to be redefined for the variation combinations to work correctly. 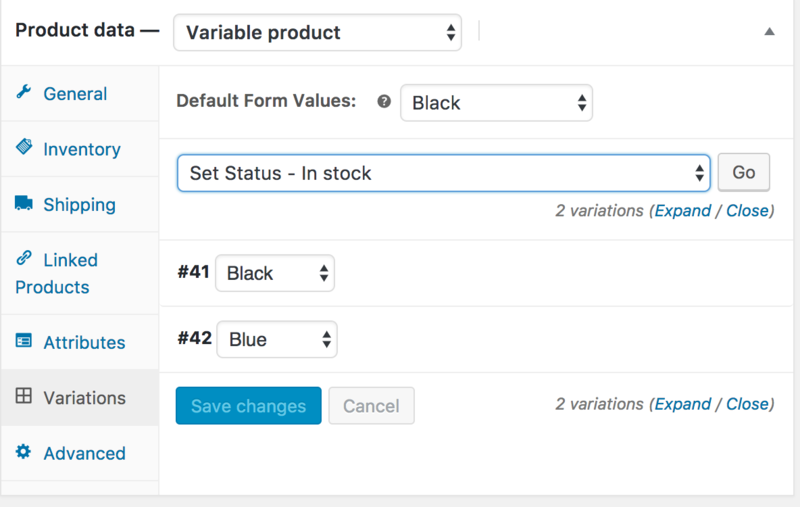 On the frontend, when viewing a variable product, the user is presented with dropdown boxes to select variation options. Selecting options will reveal information about the variation, including available stock and price. If the user tries to click the greyed out add to cart button before choosing an attribute, a message will appear asking them to create some attributes. In the product archive page, Add to Cart does not display because a variation must first be chosen before adding to cart on the product page.